August 16, 2012 - Gulfstream Aerospace Corp.’s super-midsized G280 aircraft is closing in on entry-into-service (EIS). As of July 31, the three aircraft used during the flight-test program have flown more than 2,000 hours over more than 740 flights. The fatigue test article has completed more than 17,000 of 40,000 cycles. The G280 received provisional type certificates from the Federal Aviation Administration (FAA) on March 1, 2012, and the Civil Aviation Authority of Israel on Dec. 29, 2011. The aircraft is slated to enter service later this year after the final type certification requirements have been achieved. A number of activities are under way to prepare the aircraft and its operators for EIS. The FAA Flight Operations Evaluation Board has completed its work on establishing the aircraft’s master minimum equipment list (MMEL), an inventory of systems, instruments and equipment considered essential for safe flight. The European Aviation Safety Agency is in the final stages of approving the G280 MMEL for use by European operators as well. Gulfstream training partner FlightSafety International has developed and built a state-of-the-art, full-motion simulator to train flight crews in the new G280. The simulator is fully equipped and includes the optional intercontinental flight package. The simulator, which was manufactured in Tulsa, Okla., is now on location at the Dallas FlightSafety Learning Center. It has received interim Level C qualification, with Level D qualification expected after the G280 receives its type certification. Serial Number (S/N) 2004 has received an FAA Special Airworthiness Certificate, allowing Gulfstream to use the aircraft for marketing demonstration and surveys. The aircraft has a fully outfitted interior and has already set four city-pair speed records with passengers on-board, Dallas to Washington, D.C.: 502.25 mph, Washington, D.C., to Geneva: 525.59 mph, Paris to New York: 469.95 mph and New York to Dallas: 489.52 mph. 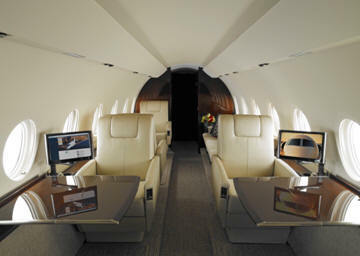 Gulfstream confirmed in October 2011 that the G280 exceeded the major performance capabilities announced at the program’s public launch in 2008. Following extensive flight testing, Gulfstream demonstrated that the G280 flies 3,600 nm (6,667 km) with four passengers at Mach 0.80 with NBAA IFR reserves. In addition to more range, the aircraft offers a shorter balanced field length. Its balanced field length has been reduced from 4,960 feet (1,512 m) to 4,750 feet (1,448 m). This field length is an improvement of more than 1,300 feet compared to the G200 it replaces.